Electrical Engineering question here. How to increase peak voltage dc square wave. Thread: Electrical Engineering question here. How to increase peak voltage dc square wave. I have an Electrical Engineering question here. Was hoping perhaps someone could help me with a component i'm not familiar with just yet. How to connect it in this circuit and perhaps even a pin out explanation would be amazing. Here is my dilemma first of all. I have designed a circuit in multi-sim that creates around a 5hz clock pulse using a voltage divider to cut the 12VDC car battery voltage down to a nominal 5Vdc. I have also used a number of logic gates, And, Nor, and even a Not gate inverter to preform medial logic functions. The purpose of this circuit is to alert the driver to the presence of a door being opened and the headlamps being left on. The And gate in the circuit is used to distinguish most of this. As when both inputs to an and gate are high the output is therefore high. Or in binary 1*1=1. If for any reason the headlamps are off and the door is open this halts the circuit from alerting. Which is great because there is no constant annoyance and one doesn't misinterpret the alarm as being a simple annoyance. Transistors where also used to create an oscillating visual warning of the alarm being omitted. As well as a pizeo speaker audible alarm. Now herein lies my problem. The pizeo buzzer. If connected to the output of the 555 timer chip the output voltage here is far too low. You can surely hear the clock pulses. The binary function is there. 1,0,1,0. Though the only problem is that since the voltage/current is too low or power to this speaker it is far weaker than it's maximum potential. For example after all the voltage drops through the ic logic gates .7 for silicon. We are left with around a nominal 3.4vdc The speaker emits sound at 3vdc nominal but has a max potential of 20vdc. I understand the 20vdc is an impossible feat. This is because pin/pout or efficiency would have to be in excess of 100 percent which is impossible. However i do gather that there must be a way to raise this current/voltage back to the Vs or source voltage max of 12vdc nominal which would be far louder than 3.4vdc. It is also 50 percent of max meaning it will not only be quite loud but it would also have a very long life span at only 50 percent of max tolerance. Now. All of this in mind. I need a component i can add a square wave clock form to that will also allow me to increase my voltage and current back to their max thresholds but keep that pulse so that the pizeo speaker beeps or chimes. Thank you for any help in this regard.. Please remember the goal here is to raise voltage or E energy back to the source voltage 12v without stripping the source signal into the speaker. This way it is amplified the peak voltages of the square wave. If anyone knows how to do this and could maybe shoot me a easy to read schematic it would be much obliged. I have considered using the transistors I have as amplifiers. Thought their input voltage is max 6v threshold. Meaning they would likely start on fire from 12Vdc. Also i'm not really familar with the science behind how to build an amplifer. But i surely need a crash course because i really need to finish this and i'm so close. BTW for the record i do have any capacitor i could need, ceramic, any resistor value, some npn transistors at the above mentioned rattings, 2n222 type etc. to-18 to-19 format and a protoboard obviously also have an op amp chip and many j/k flip flop 74ls113. Last edited by alpinestars_2002795; 02-20-2015 at 07:13 AM. If you PM me your contact info maybe I can have an engineer call you. Glad i got out of that. He lost me at "...circuit in multi-sim...". LOL, exactly CJR. A and B but Not C. LOL.. You got it sir! Totally. Veil guy gonna shoot you a message. I do work tomorrow I believe shutting down the shack. No fun man good stores waving bye bye every day. And nope no padding here. All is legit. Electrical engineering question. I believe I could use i high powered transistor. Having trouble finding one with the specs I need though. 12VDC input to emitter. 5VDC base. 12VDC collector would be nice. But i don't know where i'd find such a transistor with these specs? Where is Jimbonzz when you need him ? I know he'd be able to answer this . A voltage regulator won't work because it will cut the digital clock pulses IE: 101010 as CJR has stated. An op amp may work though this is ment to be used with AC from everything i've read though i do have them in my possesion. Not that i totally get how to hook one up. We will be getting to that in about 4weeks in AC circuits. Though not sure if thats going to fix my problem since as I stated I am not working on an A.C. circuit. I have considered using an inductor. Not entirely sure how many micro henry I would need though? About to get to that in my class soon as well infact perhaps monday. Which could stand to benefit me. Hey V/I*R is all you need sir. That solves a lot more problems than you'd think it could. Of course not logic function issues. But it can solve many circuit related issues none the less. No worries. And i'll shoot you my info Veil guy. Spoke to the man I most trust in this industry ( MB ) and got one of a number of answers that should suffice. Realize that I am not pretending to be an EE, so I am only relaying (no pun-intended). What you need to do is AC couple to a PUSH/PULL transistor pair. As long as you tie the source of that to a 12v source, you'll get your 12v square wave. He also suggested that you can further research this online by Googling, PUSH/PULL transistor/amplifier arrangements. He also suggested that there are simpler circuits that you could have designed to accomplish the same thing. I have passed the information to him and he will PM or reach out to you to discuss your (other) options. R_LOAD = speaker however you will want to AC couple the output of the push/pull circuit to your speaker with a series capacitor of approx 10uf. If using a polarity sensitive capacitor, the + will connect to the output of the push/pull circuit and the negative will connect to the positive input of the speaker. The negative of the speaker connects to the common circuit ground. Use when you need current gain and need both positive and negative output. A modification of the “transistor emitter follower” that can give both positive and negative outputs. 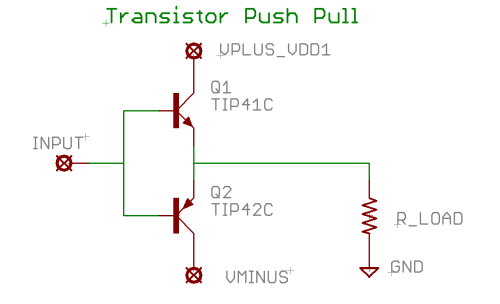 Based on two transistors one npn the other pnp: one pushes the other pulls. VPLUS_VDD Power supply voltage, positive. VMINUS Power supply voltage, negative. If you are not allowed to use the original input of 12 volts DC, you can make a voltage doubler, tripler, or quadrupler with a few caps and diodes. Other methods of generating higher output voltage without using 12 volts dc would involve AC coupling to a small step up transformer having a ratio appropriate with voltage you need. Hope this is the information you were looking for. « Finally got the Vascar II plus, and obtained a Vascar IIIC working in the labatory. anyone ever use voltage display to confirm an electrical problem?